A Bi-centenary Like No Other! If you think that’s overstating the case, you were not present at the event held by Lodge of Union No. 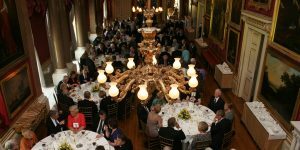 38 at Goodwood House on Monday 16th April 2012. We chose that country estate near Chichester in Sussex for the Masonic reason of being the seat of the Dukes of Richmond, about half of whom along with several of the ‘spares’, have been members of the Craft in Chichester over the centuries. 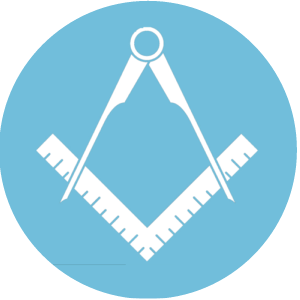 There has been continuity of Masonic activity in this city (though not by UGLE’s strict rules) since at least the 1690s. Nearly ten years in preparation, the day dawned at last. We had brought our Lodge furniture and effects, setting it up the day before in the House’s ‘Yellow Drawing Room’ (we call it ‘Gold’ for reasons below). Our checklist was consulted for the umpteenth time – discovering that the magnificent sword (larger than the Provincial one!) for our Tyler had been forgotten but soon remedied. Lists for this, charts for that, layouts for the other; all were examined minutely yet again. Final touches making everything square, level and plumb; we were as ready as we would ever be. By 8 a.m. brethren and their wives were starting to arrive. The hubbub grew; the excitement built; the adrenaline started to kick in – it was actually happening! By 9 a.m. the 28 strong Provincial team had arrived from various parts of Sussex, major roadworks notwithstanding, to rehearse their parades and to find their seats. By half past, ‘London’ had arrived in the persons, no less, of the Most Worshipful Pro Grand Master Peter Geoffrey Lowndes, the Very Worshipful Grand Secretary, Nigel Brown and the Very Worshipful Grand Director of Ceremonies, Oliver Lodge. The latter casting his eagle eyes over our humble Lodge arrangements while we were biting our nails! Sighs of relief all round with just a minor adjustment or two. The necessary photographs were taken. Meanwhile, by 10 a.m. a reception was in full swing in the House atrium with the Pro Grand Master, Grand Secretary, Grand DC, Provincial Grand Master, his Deputy and others mingling with us all over coffee – we needed the caffein! Getting on towards 11 a.m. Tyling time, so we kitted up in all our best finery. Lodge members and guests made their way into the Lodge room while the Ladies remained in the atrium to witness the Provincial and Grand Lodge glittering entrance parades, before being guided on tours of the House and its superb art galleries. Obviously I cannot go into detail of the Lodge commemorative meeting, presided over by the Master, W Bro Ivan Jones, other than to indicate that the minutes of that first meeting two centuries ago were read, commencing at the identical time, 11.15 a.m. (ignoring daylight saving time) on the identical date. Little could those distant brethren have realised what a line of continuity we would be celebrating, still surrounded by many of the same articles which they had worn, used and handled. V W Bro Nigel Brown read the Bi-centenary Charter and presented it to the Lodge. M W Bro Peter Lowndes made many kind and congratulatory remarks on our extraordinary continuity and expressing his favour of our uniquely coloured officers’ collars. The Right Worshipful Provincial Grand Master, Kenneth Thomas, also congratulated the Lodge on its longevity as well as our team for organising this splendid event. Following an insightful oration in his inimitable style by the Provincial Grand Chaplain, W Bro the Revd Stephen Terry, a presentation from the Association of Atholl Lodges and a small amount of Lodge business, this being a ‘regular’ and not an ‘emergency’ meeting, the Lodge was closed, with the various groups parading out in due form, to the delight of the ‘ladies in waiting’! After divesting ourselves of regalia and making sure the Lodge property was secure, more photographs were taken outside and we socialised over drinks until dining commenced in the Ballroom at around 1 p.m. At which and at all times the House provided us with an impeccable standard of excellence in all they did, in a completely unobtrusive manner as befits such an historic occasion. As promised at the beginning, the reason for ‘Gold’ being the colour of our officers’ collars has been, from the beginning, to commemorate the close connection between Chichester Freemasonry and the ducal family whose colour it is (vide the several Stubbs paintings at the House). 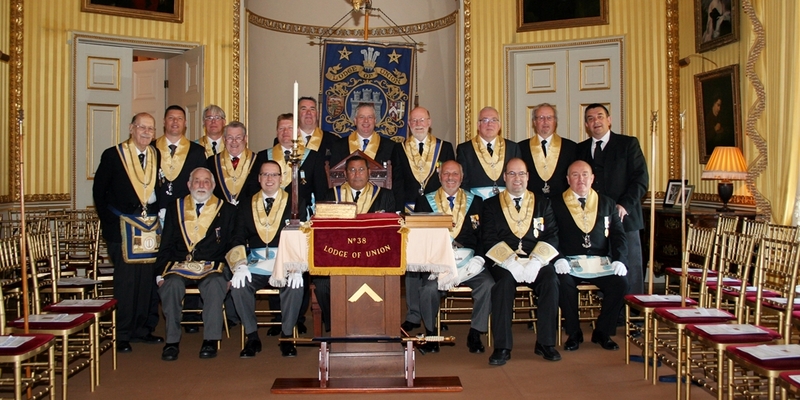 You will see from the photographs how we could not but hold our commemorative Lodge in that room. From the plaudits we have received since, we are led to recommend that you book now for our next commemorative and tercentenary meeting in 2112 – see you there!